Sourdough bread is great for many reasons; it tastes amazing, is healthy and safe for everyone and good for the gut. 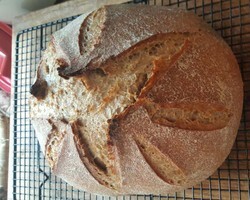 When made with the proper ingredients and using old world techniques sourdough bread can be enjoyed by those with gluten sensitivity and even those with celiac disease according to a group of scientist in Italy. Seriously, anyone can do it. The picture above and to your left is the first loaf I baked using my beloved recipe developed after much trial and error. Seriously, anyone can do it perfect the first time and every time after. Is Sourdough Bread Gluten Free and Can People with Gluten Sensitivity and Celiacs Eat it? Back when food was really good for our bodies and made naturally, sourdough starters were created using an all-natural and organic fermentation process happening overnight and overtime. During this process good bacteria break down the gluten proteins reducing and or eliminating gluten entirely. Just as Kombucha is created by bacteria eating the sugar in sweet tea rendering it sugar free, depending on the amount of sugar you use, the sourdough bacteria thrive on the wheat gluten thus gobbling it up leaving little if any to disrupt the gut. In the year 2010 a group of Italian scientists proved the gluten content was significantly lower in breads that were made using traditional old world style yeast grown in the homes of bakers across the country. The difference was so significant that celiacs volunteering for the study were able to consume the sourdough bread with no ill effects. It is for this reason so many gluten-sensitive people do fine when indulging on bread and cheese while in France, it is made using the old world fermentation process and is something we ourselves can duplicate in any part of the world. Allow this mixture to rest in a covered container until bubbly, time varies, could be 1 to 2 hours, I set mine on the stove top. Once this is bubbly you will have the leavening to make bread. The starter/leavening should float in water when ready. This is the cup of starter/leavening you will use to make your bread. This process may take one to two days. The starter should be consumed with bubbles, in other words you should see a lot of bubbles throughout the jars contents. Step 1 - In glass container with lid add 1/4 cup purified water and 1/4 cup flour blend of equal parts organic rye and white flour. Mix well with wooden chopstick (or similar) cover and let stand in warm dark place (top of fridge is a good spot) do this three times a day, three hours apart for 3 days, each time start with only 1/4 cup starter to 1/4 cup both water and flour mix. Step 2 - On day 4 measure out 1/4 cup of the contents in jar, rinse jar, combine the three, mixture, 1/4 cup flour and 1/4 cup purified water, stir well, cover returning jar to the dark warm area repeat this twice a day 12 hours apart. Repeat step 2 every day at the same time for 7 more days, it is then your starter should be ready to use for dough. Typically it takes two weeks to create a starter with enough wild bubbly yeast to make bread. Feeding it more frequently makes it better. Once you have the perfect starter you can store it in the fridge for up to one week. Many have left it much much longer and brought it back to life. When storing starter in fridge you should feed it once a week as outlined above. Different areas of the country have different weather conditions and wild yeast both will impact the creation and maintenance of your starter. If you forget to feed your starter in one week, do it when you remember. Add 2 cups of flour at a time mixing gently, let rest for 10 to 15 minutes to allow the flour to absorb water. This also helps feed your leavening. After 10 or 15 minutes add 2 more cups and once again wait 10 to 15 minutes. Finally add one more cup total of 5 cover and allow to rest for 30 minutes to 1 hour. The 6th cup can be added bit by bit if needed after 30 minute rest during the slap, stretch and fold technique. Do not add any or all of the 6th cup unless the dough is to wet to remove from bowl. Note: This helps insure you don't use to much flour (causing bread to be to dense) it takes flour a while to absorb water. Use a strong starter, it should be very bubbly and float, the portion removed each day during feedings can be added to water, if it floats you have a good starter. It should also be bubbly, if starter does not meet both criteria feed it twice a day for a few more days or until it is ready. Use a light flour, wheat is heaviest, white is lighter, spelt and einkorn make the lightest bread of all. Add baking soda before shaping during step 5. Add 1/2 to 1 teaspoon to dough for one loaf right before shaping by sprinkling it onto the dough before folding it. Let it rise enough and in a warm place. This step varies greatly after having spent the night in the refrigerator. If you do not want to leave it overnight in the fridge bake it after the final shaping on step five once the dough has increased in size enough that a dome begins to form. An important aspect of this process is patience, do not rush the process, remember it requires stages and it is between these stages that you can forget about the dough and get on with other things. After the half hour mark mix 1 tablespoon of sea or fine himalayan pink salt with two tablespoons warm water till salt is dissolved. Once dissolved pour over dough and work throughout dough using hands, plastic spatula or spoon. Note: whatever you choose make certain it is a strong and sturdy choice as anything else can and will break during this process. Once the salt is added dump dough out onto a non porous surface, mix dough using the slap, stretch and fold technique I demonstrate in the video below. Do this for 10 minutes, return dough to bowl, cover with towel, sit for 4 hours. Once dough has set for 4 hours remove dough from bowl and onto nonporous surface, sprinkle the top with a mixture of white flour and coconut flour, flip dough over and begin folding sticky dough surface toward the middle as seen below. Only do this for 6 to 8 turns, return to bowl, cover with towel and rest for 30 minutes and repeat this process, video included demonstrates the 2nd fold and shape technique before dough goes into fridge overnight. HINT - If you just don't want to put the dough in the fridge overnight to suffer the wait, you have another option! Once the final shaping is done, put dough in banneton, cover and leave to rise in a warm, not hot spot. It may take 2, 4 or even 6 hours. Once the dough has risen and springs back from a gentle touch follow the baking directions below in that section. Either way works FINE! The first image to your left is the dough after having spent the night in the refrigerator and the Banneton. I will be carefully place the dough into the banneton which has been dusted with equal parts of coconut and white all purpose flour. The Second Image is the dough after I transferred it from the glass bowl and into the Banneton, a proofing bowl specific for artisan breads such as our beautiful sourdough seen here today. I bought mine on Amazon, it included the cover seen below and the bread dough scraper you've seen me use in the above videos. I will include the link to buy your own. Third image is the dough covered in the Banneton. The dough will proof for 2 to 6 hours at which time we will peek in to see if it has risen enough. The time needed to proof the dough depends on weather and temperature. Don't rush it or bread will be to heavy and dense. I apologize for this image being sideways, I am my own camera person and photographer, obviously I am not a professional. It is real life and I feel no need to be perfect. It has been two hours and my dough is still really cold, it is cool here in Ohio so I am going to let my dough sit in the dark oven for another hour or so. I will keep you updated. Trick - I turned my gas oven onto 350 for about a minute allowing the oven temperature to rise to 100 degrees and then quickly turn it off so it won't get to hot but simply warm up the environment for the dough to better rise. At two hour mark preheat oven to 485 degrees fahrenheit heating dutch oven with lid at this temperature for 30 minutes, it will be blistering hot so be careful. 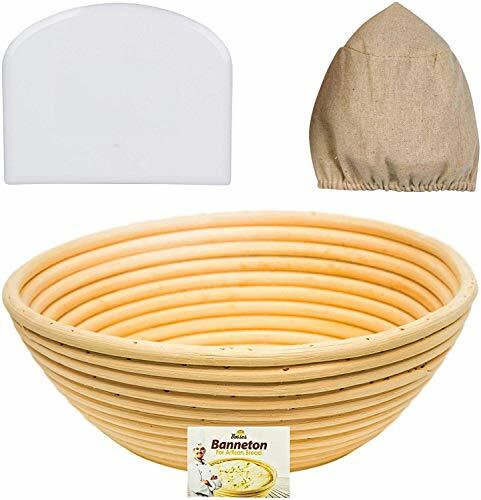 Once reaching the 20 minute heating time turn the dough from the banneton upside down onto damp parchment paper, misted heavily with water from spray bottle. Slice air vent design into dough gently with blade. Carefully remove dutch oven from oven, remove lid, sitting to side, pick up dough using both ends of parchment and carefully place the dough in the center of oven. Using a wooden spoon or spatula straighten parchment paper along the edges of dutch oven away from dough. Mist dough heavily with spray bottle, return lid to dutch oven and put into oven, closing oven door. At this time reduce oven temperature to 430 degrees fahrenheit. Bake at this temperature with lid for 25 minutes, remove lid and allow to bake without lid for another 25 minutes or until golden brown. Remove when down place bread on cooling rack until cooled, slice and enjoy! First image to your left is the bread once I removed it from the dutch oven and placed it on the rack to cool, the hardest wait of all! Second Image is the sliced bread, this is my downfall, it is so hard to wait but it is crucial to do so. If you cut your bread and it is gummy in the middle this means you no doubt cut it to soon. Sourdough bread is a dense bread and need to cool otherwise the loaf collapses in on itself making it do dense. Third image is a nice slice buttered with REAL BUTTER, I never mess around with anything other than the real thing and yes I use organic. Finally, I was much to anxious to video the tasting but it was DELICIOUS! Something so good is well worth the effort. In fact, I began a new batch of sourdough for a new loaf tomorrow. Look Below for the Questions and Answers Portion of this Site, There are no silly questions. Look to the bottom of this page to find the Q and A section where you may submit any questions you have. I will get back with an answer ASAP! Until next time, Enjoy each and everyday! Glass Mixing Bowl - Mine in this picture has not been cleaned, I just removed dough from it. Cast Iron Dutch Oven (required to maintain and control high baking temperature and blistering crust. 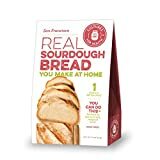 Baking Sourdough Bread Q and A Section, All questions welcome! I use cherry wood, made by my father, I also wash my hands a lot, I am a germaphobe, I clean my wood with organic apple cider vinegar. katiem2, It's always a pleasure to return to food-related wizzleys by you, Mira and Veronica since the learning never ends. I notice something new each time. What kind of wood do you favor for boards, counters and utensils? How do you keep your rings so photogenic? happynutrionist, Now you can teach your sister a thing or two. Happy baking. Thank you for making this look easy, my sister makes sourdough bread and I've wanted to try, I think I will soon. mihgasper, Enjoy and feel free to come back with any questions you may have. Do check in to let us know your homemade sourdough bread results. Looks amazing - got to try it! MBC, my pleasure, feel free to pop in anytime with your bread baking questions and or to share with us about your adventures in baking. Vincent, That is fantastic news, and how smart on your part, brilliant! This is very exciting, I am thrilled for you because it can be difficult to get a good starter going if one does not adhere to the feeding schedule and proper ration of plain and rye flour. I am excited to hear more about your first experience. Yippy Kyee Indeed! Katie, I went to my local Organic Pastry and Bread making store. It's also where I purchase my delicious Sourdough from. I told them I plan on making my own and asked if they sell starter. Well to my surprise they said no, but would gladly provide me a full cup of their own and anytime I need some more to come by and get some for FREE. Well that was a bonus, so I took a cup and placed it in my fridge. Now I will follow your instructions to the tee to make the bread. I was hoping to find a quicker way to make a starter and voila I've found it. How nice of them, but I am also a good customer of theirs so they were kind enough to give me some. Yippy Kyee. I love sourdough - thank you for the baking lesson. How Many Calories are in Avocados? Avocados are high in fat, how many calories are in avocados and will they make you fat if you eat them. How much avocado can you eat without gaining weight? Learn the truth now.